If you’re coming to Chicago from near or far, you may well enjoy the charms of being out and about in River North. It’s right next to the Chicago River (hence its clever name) and you can walk into the Loop or over to Michigan Avenue in just a few minutes. With a raft of lively bars and nightspots, there’s quite a bit to do. I’d recommend a stay at the lovely Kinzie Hotel, as the staff are welcoming and the amenities in the rooms are quite fine. 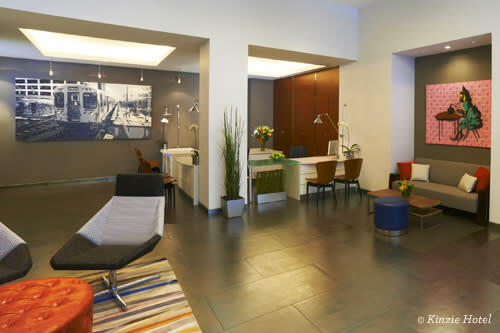 As you step inside the Kinzie Hotel Chicago, the contemporary lobby offers up a bit of modern sensibility with nods to local flavor, including an elaborate mural of a CTA car executed with colorful duct tape. 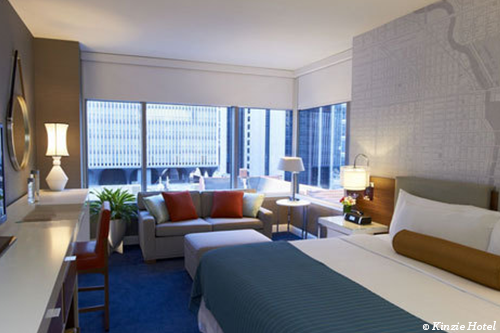 The Kinzie Hotel is a welcoming place that features king and double queen guest rooms, along with one-bedroom suites. 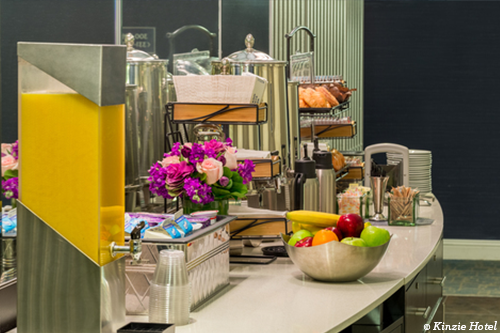 Every room includes a 42-inch flat-screen HDTV, H20 Plus spa products, a work station and a cornucopia of gourmet coffees, assorted teas and hot chocolate. Also, as a nice touch, the decorative wallpaper behind each bed features an original plat map of downtown Chicago and beyond, so that visitors can see a bit about the history behind the city. Rooms also have a short bio of John Kinzie, the original settler who gave the hotel its name. While you may want to stay in the hotel all day and night, there’s a wonderful continental breakfast each morning and a "manager’s reception" featuring complimentary cocktails every evening to draw you out of your room. The latter is a great way to meet up with your fellow travelers before heading out each evening. These days, the Chicago Riverwalk is the talk of the town. The recent additions to the south bank, extending the fabulous pedestrian path, has received awards from urban planners and landscape architects. The causal visitor can rent a kayak to take out on the water, bring out their fishing pole or just sit and have lunch at the diverse eateries that dot the waterfront here. It’s also easy enough to jump on board the Chicago Water Taxi for a few bucks just to glide up and down the river, with stops at Michigan Avenue, Madison Street and all the way to Chinatown. 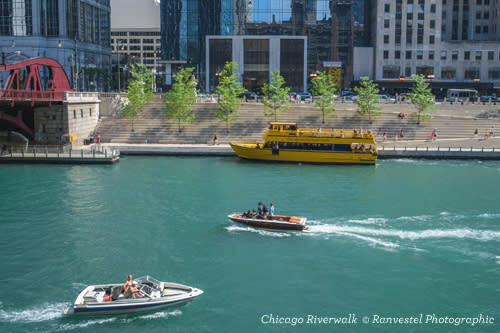 Of course, architecture fans will want to book passage on one of the Chicago Architecture Center’s celebrated boat tours, which may make converts out of folks who may not be generally interested in architecture. Chicago’s musical legends are many: Muddy Waters, Kanye West, Smashing Pumpkins, and of course, the men and women who make up the Chicago Symphony Orchestra. And in terms of jazz, well, there are thousands who have plied their trade from 63rd Street to the corner of Lawrence and Broadway. 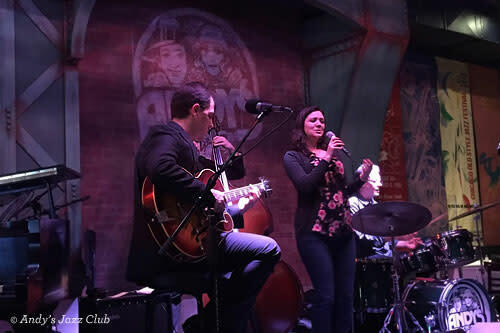 In a city of musical legends, the best place to hear jazz in River North is Andy’s Jazz Club & Restaurant. Located right around the corner from the Kinzie Hotel, they have jazz every night of the week. On any given evening, you might see a saxophone quartet, take in a bit of vocals, or hear an ensemble winding their way through Chicago on a long road tour. They usually have two shows a night and the cover is never more than $20, which is quite reasonable. You’re welcome to stay for both sets, have a drink or book a table and enjoy dinner with friends. Before you head over, you can also look over their complete calendar to see who’s playing. All in all, it’s a perfect way to conclude an evening before returning to your room at the Kinzie Hotel. Check out our guide to River North for things to do, places to visit and restaurants and bars in this hopping Chicago neighborhood. Here are a few ideas to add to your weekend itinerary: take a free gallery tour of local art galleries, organized by Chicago Gallery News, then break for coffee and Italian treats at Eataly.